Stylish, complex and present without the annoying “in your face bling bling“. That’s how I see the Tradition Minute Repeater Tourbillon Chronograph by Audemars Piguet. The soft anthracite dial comes with pink gold Arabic numerals and the distinguished hands are of the same soft pink gold. The eye catcher is obviously the “heart” of the Tourbillon Chronograph. Fitted center bottom of the dial. The strap is a hand-stitched “large square scale” black alligator strap. Which closes around your wrist with a 18-carat white gold Audemars Piguet folding clasp. The diameter of this stylish watch is 47mm so not the best one to wear when you have small wrists. Although the Tradition Minute Repeater Tourbillon Chronograph might look bulky, as one might think from seeing the picture, reality tells us this is not the “case”. It’s an easy to wear comfortable piece of jewelry that fits in on all occasions. Stylish night life, lazy afternoons or sporty day time events this one blends in smoothly. 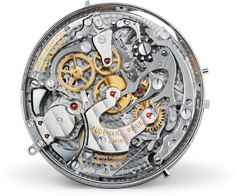 Audemars Piguet has fitted this watch with a mechanical hand wound movement containing 504 individual pieces. Their watchmakers must have a hard time fitting all these pieces in the 7.65mm space they are given. Especially fitting the tourbillon of the Caliber 2874 with the triple complicated movement. A 30 minute counter is one of the extra features. The frequency of the balance (variable inertia screws) is 3.00 Hz, which equals 21’600 alternances/hour. The balance-spring stud-holder is a mobile stud and the spring type is Breguet. The jewel count is 38. All of this together generates a power reserve of up to 48 hours before you need to wind again. 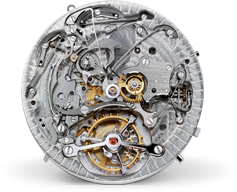 As one might expect Audemars Piguet has no intention whatsoever to hide this beauty and therefore the back is covered with a glare proofed sapphire case back so you can always take a peak at the wonderful “machine” inside of your watch. For me the back of a masterpiece with complications is just like watching waves or flames, it never bores. I’m always so impressed and wonder how one can assemble such a complicated combination of hundreds of elements, yet still giving the exact time. Its hard not to think if there ever will be a time when the “Horlogers” will stop adding dials to their creations and only show the complications to us the watchionistas. Who needs time anyway? !